Describe a counterbalance valve using the 5 main characteristics used to classify pressure control valves. Describe the basic operation of a counterbalance valve. 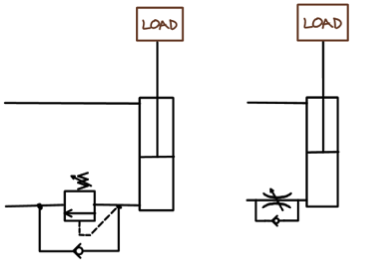 Compare the operation of these two hydraulic circuits when the laterally manipulated load is fully supported by some outside force. 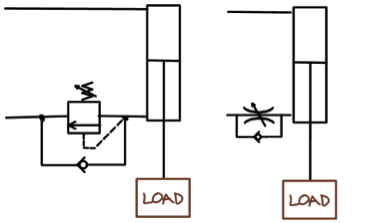 Compare the operation of these two hydraulic circuits when the vertically manipulated load is influenced by some outside force like gravity. 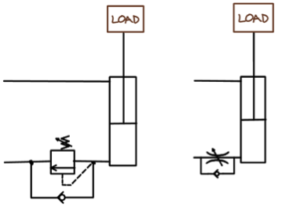 Compare and contrast these circuits making use of counterbalance valves and meter out flow control circuits. Describe the operation of this circuit making use of an internally piloted counterbalance valve. Comment on the maximum downwards force exerted by this system. Describe the operation of this circuit making use of an externally piloted counterbalance valve used to lower a heaving mold, forming piece or platen. Comment on the behavior of this system during lowering and the maximum downwards force it is capable of generating. 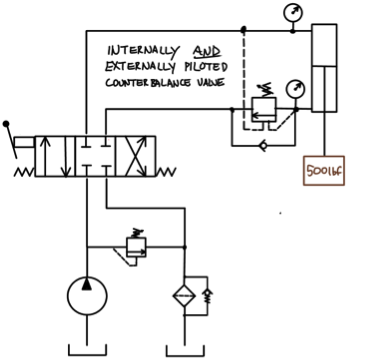 Describe the operation of this circuit making use of an internally and externally piloted counterbalance valve used to lower a heaving mold, forming piece or platen. Comment on the behavior of this system during lowering and the maximum downwards force it is capable of generating. Comment on observed behavior of hydraulic systems for different counterbalance valve set values and loads. Compare and contrast the general behavior of internal, external, and internal and externally piloted counterbalance valves.